Set social line color on the footer.Set text color of menu on the footer. Set background color of tag cloud widget on the footer. In this part, you can choose footer layout for your website. Choose a desired layout style for footer. We provide 7 kinds of the footer layout style or the best website’s look. 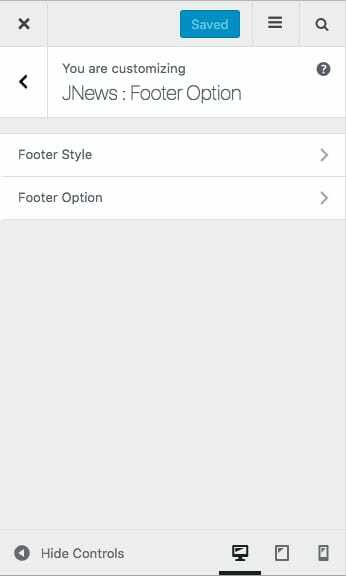 In this part, you can setup several options of the footer. Insert text for your site copyright. You can also insert html tag like anchor tag (a), bold tag (b), strong tag (strong) and emphasis (em). Choose an image as logo on the footer. Please note, this option will appear and work if you choose Style 7 on Footer Style option. Choose an image as retina logo on the footer. Please note, this option will appear and work if you choose Style 7 on Footer Style option. Insert alternate text of the footer logo. Please note, this option will appear and work if you choose Style 7 on Footer Style option. Insert text for navigation footer. Please note, this option will appear and work if you choose Style 7 on Footer Style option. Insert text for social footer. Please note, this option will appear and work if you choose Style 7 on Footer Style option. Turn on this option to force footer into fullwidth. Please note, this option will appear and work if you enable Boxed Layout option. Turn on this option t show social icon on top of the footer. Please note, this option will appear and work if you choose Style 5 on Footer Style option. Insert additional text on the footer. Please note, this option will appear and work if you choose Style 4 on Footer Style option. Turn on this option to show secondary footer. Please note, this option will not appear and work if you choose Style 7 on Footer Style option. Adjust the position of menu on the secondary footer. Please note, this option will appear and work if you choose Style 1, Style 2, Style 3 or Style 6 on Footer Style option. Adjust the position of copyright on secondary footer. Please note, this option will appear and work if you choose Style 1, Style 2, Style 3 or Style 6 on Footer Style option. Adjust the position of social icon on secondary footer. Please note, this option will appear and work if you choose Style 1, Style 2, Style 3 or Style 6 on Footer Style option. Choose scheme style of the footer. Set background color of the footer. Set general color of text on the footer. Please note, this option will not appear and work if you choose Style 7 on Footer Style option. Set title color of widget on the footer. Please note, this option will not appear and work if you choose Style 4 or Style 7 on Footer Style option. Set general link color for footer. Please note, this option will not appear and work if you choose Style 4 or Style 7 on Footer Style option. Set link hover color for footer. Please note, this option will not appear and work if you choose Style 4 or Style 7 on Footer Style option. Set background color for input form on the footer. Please note, this option will not appear and work if you choose Style 4 or Style 7 on Footer Style option. Set text color of input form on the footer. Please note, this option will not appear and work if you choose Style 4 or Style 7 on Footer Style option. Set background color of tag cloud widget on the footer. Please note, this option will not appear and work if you choose Style 4 or Style 7 on Footer Style option. Set text color of tag cloud widget on the footer. Please note, this option will not appear and work if you choose Style 4 or Style 7 on Footer Style option. Set color of line separator on footer.Please note, this option will appear and work if you choose Style 1, Style 2, Style 4 or Style 5 on Footer Style option with Show Secondary Footer option enabled. Set background color of secondary footer. Please note, this option will not appear and work if you choose Style 7 on Footer Style option. Also you need to enable Show Secondary Footer option. Set color of copyright on the footer. Please note, this option will appear and work if Show Secondary Footer option enabled and Copyright Position on Secondary Footer not hidden. Set link color of copyright on the footer. Please note, this option will appear and work if Show Secondary Footer option enabled. Set text color of navigation on the footer. Please note, this option will appear and work if you choose Style 7 on Footer Style option. Set line color of navigation on the footer. Please note, this option will appear and work if you choose Style 7 on Footer Style option. Set text color of menu on the footer. Please note, this option will appear and work if Show Secondary Footer option enabled and Copyright Position on Secondary Footer not hidden. Set hover text color of menu on the footer. Please note, this option will appear and work if Show Secondary Footer option enabled and Copyright Position on Secondary Footer not hidden. Set separator color of menu on the footer. Please note, this option will appear and work if Show Secondary Footer option enabled and Copyright Position on Secondary Footer not hidden. Set social icon color on the footer. Please note, this option will appear and work if Show Secondary Footer option enabled and Copyright Position on Secondary Footer not hidden. Set social icon hover color on the footer. Please note, this option will appear and work if Show Secondary Footer option enabled and Copyright Position on Secondary Footer not hidden. Set social icon background color on the footer. Please note, this option will appear and work if you choose Style 5 on Footer Style option. Also you need to enable Show Social Icon option. Set social icon color of menu on footer. Please note, this option will appear and work if you choose Style 5 on Footer Style option. Also you need to enable Show Social Icon option. Set social icon Text color on the footer.Please note, this option will appear and work if you choose Style 5 or Style 7 on Footer Style option. Also you need to enable Show Social Icon option. Set social line color on the footer. Please note, this option will appear and work if you choose Style 7 on Footer Style option. Set social icon hover background color on the footer. Please note, this option will appear and work if you choose Style 5 or Style 7 on Footer Style option. Also you need to enable Show Social Icon option. Set social icon hover text color on the footer. Please note, this option will appear and work if you choose Style 5 or Style 7 on Footer Style option. Also you need to enable Show Social Icon option.